September 4, 2018: READ THE UNOFFICIAL RESULTS from the Milford Town Clerk. The deadline to register to vote and/or change your political Party is Wednesday, August 15th by 8:00 p.m. in the Milford Town Clerk’s Office. If you will be unable to vote at your Precinct during normal polling hours (7am-8pm) on September 4, 2018, you will be eligible to vote by Absentee Ballot. If you require an application and/or a ballot to be mailed to you, you will need to call our office at 508-634-2307 as soon as possible to have an application mailed to you. 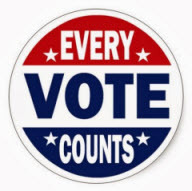 We do have Absentee Ballots available in our office and you can also apply and vote in person at the Town Clerk’s Office if you are unable to vote at your Precinct during normal polling hours on Election Day. The deadline to apply for an Absentee for the State Primary is August 31st by 5:00pm but if you need an application or ballot mailed to you for the Primary I would contact our office as soon as possible to expedite the process to ensure you receive your ballot in sufficient time for you to vote and return the ballot before 8:00 pm on Election Day (Sept. 4th). Wondering who the candidates are in each of the three political parties? 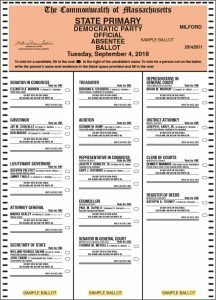 You can view the State Primary 2018 Sample Ballots for the Democratic, Republican, and Libertarian Parties here. All three ballots are in the same file. Just click the link and scroll through.